Kids and music: They’re a perfect match for one another! When it comes to selecting a great instrument for your child to learn to play, the ukulele is a top choice. Smaller than the guitar, it’s a good size for little hands, and with just four strings, it’s also easier to learn. Simplicity means faster skill-building and less frustration, so your child builds a good foundation for future musicianship. 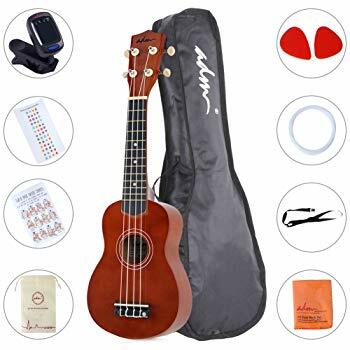 Our Top choice is the ADM Beginner Ukulele starter pack includes a standard-size soprano ukulele with a Pack Bundle with Gig bag Tuner Fingerboard Sticker Chord. 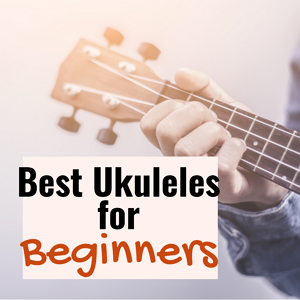 Ukuleles can be very inexpensive; even some better models come in at well under $100, and many cost less than $50, so your investment is minimal compared with the price that comes with other instruments. 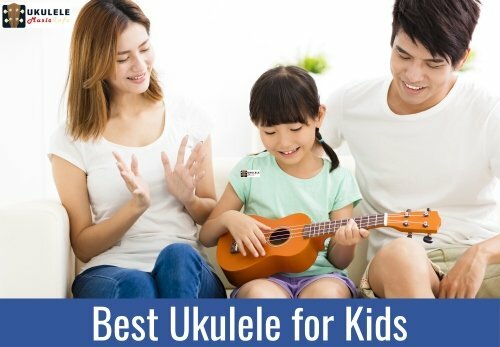 With cost and a few other factors in mind, we’ve curated a list of five of the best ukuleles for kids. Get ready, because the coming adventure is sure to be fun! 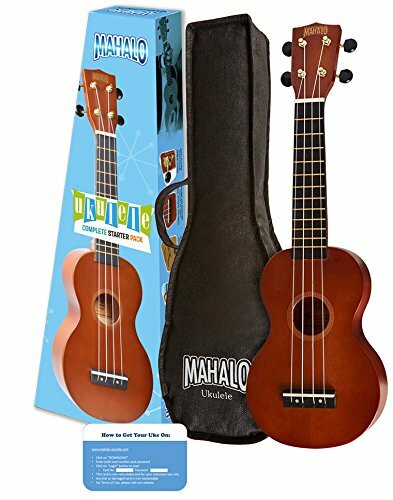 I am a school music teacher and have purchased over 40 ukuleles in the past 4 years I love this one – the price is great, the case is good, and it comes with extras. The kids love the dolphin design! Great sound and a very pretty design. I bought this for a 15 year old to learn on, and she loves it. Teens and pre-teens enjoy this ukulele since it has a fun look, but is definitely not a toy. 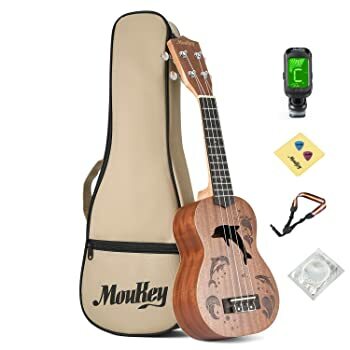 Teachers, parents, and other relatives approve too – even though this ukulele comes with lots of nice extras, it’s affordably priced and can be found for under $50. A pink ukulele takes center stage in this starter pack from ADM. Made with a basswood top, linden back and sides, a basswood fingerboard, and a basswood bridge, this ukulele is definitely not a toy – but its adorable pink color encourages girls to pick it up and play. The pack includes a clip-on tuner with an LED display, along with a hook-in neck strap and a pink waterproof carrying case. A fingerboard sticker and a chord card are included. This kids’ ukulele comes with a one-month 100% money-back guarantee and a one-year warranty against manufacturing defects. 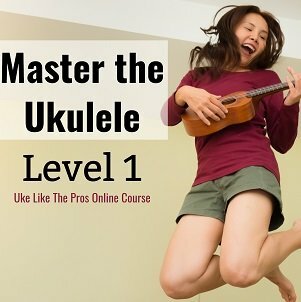 While it’s not top of the line, this ukulele is a fantastic starter instrument, and the many “extras” are great to have. It is sturdy, and it sounds pretty good! I got this for my 5-year-old daughter, though sometimes I use it as often as she does. The pink color is beautiful, and it’s a lot of fun to play. The case can be a little hard to take on and off, but it’s not a big deal. 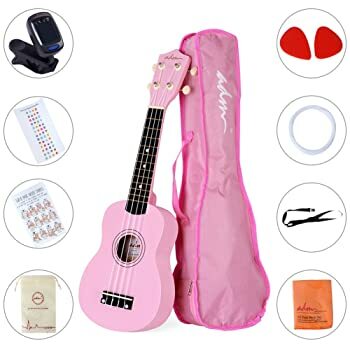 If you’ve got a little girl who is longing for a pink ukulele, but you don’t want to spend much money, you’re likely to find this is a fantastic choice. 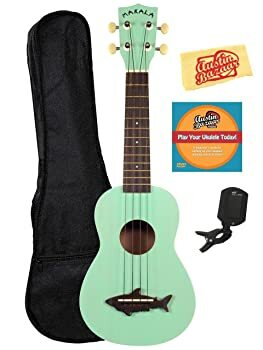 At just over $30, it comes with plenty of nice extras while offering a “real ukulele” experience. Although some reviewers have noted manufacturing defects, the warranty and satisfaction guarantee mean that replacements are available if needed. 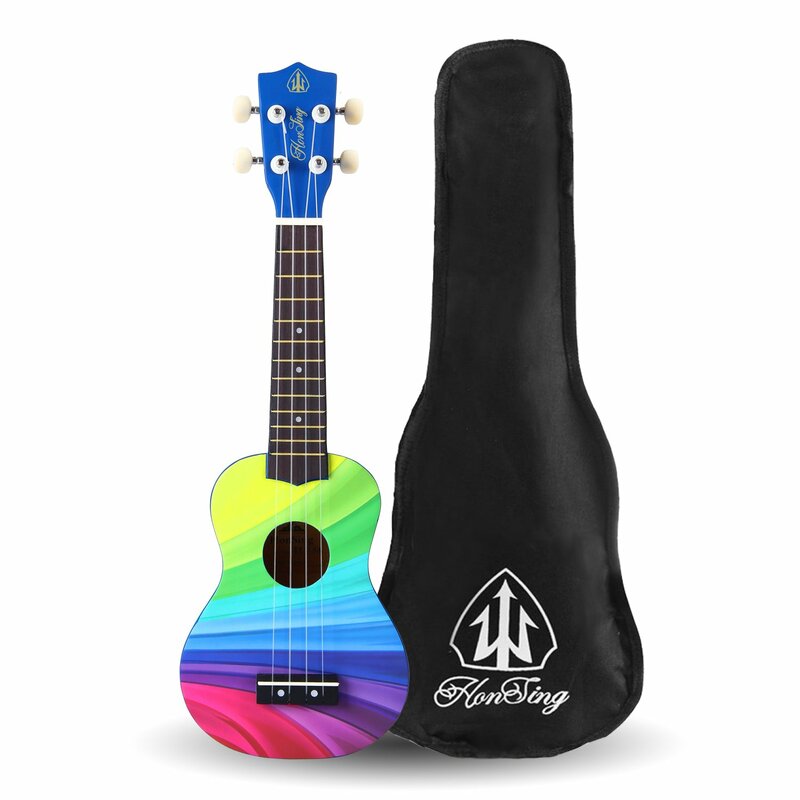 With its bright rainbow stripes finish, this Honsing soprano ukulele offers a colorful alternative to a standard wood-finish ukulele. Made with durable basswood, it features a rosewood bridge and fretboard. A carrying bag is included. Perfect for a kid who is starting out on a new instrument, and who hasn’t really developed any attachment to playing. It’s cheap but properly functional, and the finish is appealing to kids who like bright colors. Our daughter loves this ukulele, and that inspires her to practice! When she improves, we’ll shell out the cash for a better one. I bought this ukulele for my 5 year old daughter who is currently obsessed with the movie Coco. I took out some sharpies to add the designs to it and she is in love! We bought it mostly to use as a toy, but I’m hoping this will help her become interested in music. She plays it every day. The strings are strong, and it’s small enough for her to carry everywhere. 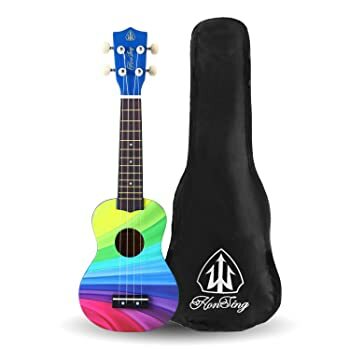 If you’re looking for a cheap, colorful kids’ ukulele but the idea of a plastic instrument is a turnoff, your search might be over. This one is popular with parents who have kids between the ages of 5 and 10, and a few with older and younger children report success, too. Designed to appeal to boys and girls alike, the Kala MK-SS-GRN shark soprano ukulele in surf green is well-known as one of the best entry-level ukuleles available. The shark-shaped bridge and rosewood fingerboard contrast nicely with the body and headstock. Quality materials and components including Aquila strings, an agathis top, mahogany neck, and geared tuners assure longevity. The bundle includes a gig bag, a clip-on digital ukulele tuner, and an Austin Bazaar instructional DVD. Bought this for our eleven year old granddaughter for Christmas and she absolutely loves it! The sound is great and it not only came with an inner thin case, but also with a well-padded carrying case. For the money you can’t go wrong! We have loved having this in our family. None of us are musically include so we’re all learning how to play it. It’s a lot of fun to have around the house – everybody always wants to pick it up and strum. The Kala Makala shark ukulele is popular with youngsters, pre-teens, and teens – and it’s also a popular choice with adults. At just a little over $50, this starter pack does cost a bit more than some other options, but the “extras” and quality components bring plenty of value to the table. Sized to fit even younger children, the soprano ukulele in this starter pack comes strung with Aquila nylgut strings for comfortable playing and a pleasing sound. Dolphin-shaped tuning machine heads add a whimsical touch, and a glossy finish lends a classic appearance. This starter pack includes a carrying bag and a digital lesson download, courtesy of “Ukulele Bartt” Warburton. The 45-minute lesson covers tuning, playing technique, and much more. Thrilled and surprised by how great this ukulele is. It already comes with nice Aquila strings instead of flimsy cheap ones, and it took just about 4 days for the strings to stretch so they stayed tuned. The sound is sweet and authentic, and intonation is so much better than expected given the cheap price. We bought this as a Christmas gift for our musically-inclined 12 year old daughter. It fits the bill for a first uke, and our daughter loves it. She plays it weekly without any enticement from her mother or me. If you are looking for a “real” ukulele that’s not too expensive to give to a child who might damage it, then this one is well worth considering. At well under the $50 mark, it is an affordable choice. The “extras” add even more value. Ukuleles are more popular than ever, and kids of all ages want to learn to play. While your choice will certainly be influenced by your child’s taste as well as the level of commitment displayed, there are a few other things to keep in mind. Materials and Components: You might be tempted to go for a cheap ukulele, but unless your child is a toddler who will bash the instrument around, it’s better to look for a real wood ukulele. Laminate is just fine, particularly for beginners. Geared tuners prevent frustration and keep your child’s interest up. Color and Style: Many children appreciate bright colors and unique motifs, so look for something with fun style elements. Your child will be more likely to practice if the look of the instrument is appealing. Accessories: While accessories such as tuners and gig bags aren’t essential, they are very nice to have. Look for elements like online lessons, CDs, or DVDs if your child seems serious about learning and you aren’t quite ready to invest in a teacher. Cost: You should find that it is easy to stick to your budget, especially if you opt for a bundle and look for an option that comes with free shipping. Unless your child displays a high level of interest and commitment, look for options under $100. You’ll find plenty to choose from including kid-friendly ukuleles between $25 and $50. Have fun making your choice! Your efforts are sure to be appreciated and with a little time and practice, your child will be able to play popular songs.